Mumbai woke up to more rain this morning as Cyclone Ockhi passes by the coast of Maharashtra today before hitting land at around midnight as a deep depression near Surat in Gujarat. Prime Minister Narendra Modi, who said he was "continuously monitoring the situation" appealed to BJP workers in Gujarat to help people across the state. "Spoke to all relevant authorities and officials. All possible assistance is being provided to those affected," he tweeted. Schools in Mumbai and neighbouring districts of Maharashtra are closed today as a precaution. In Surat, about 283 km from Mumbai, rescue teams have been stationed. 1. Cyclone Ockhi, which battered parts of Kerala, Tamil Nadu and Lakshadweep islands and claimed over 20 lives in the southern states, will make landfall near Surat and the Gulf of Khambhat in Gujarat as a deep depression early on Wednesday, the met office has said. Teams of the National Disaster Response Force or NDRF have been stationed along the coast near Surat and Saurashtra. 2. "With Cyclone Ockhi expected to make a landfall in Gujarat, I appeal to @BJP4Gujarat Karyakartas to focus on helping people across the state. Our Karyakartas should devote themselves to providing all possible assistance and stand shoulder to shoulder with fellow citizens," PM Modi has tweeted this morning. 3. Election rallies to be addressed by BJP chief Amit Shah and others near the Saurashtra coast in Rajula, Mahuva and Sihor have also been cancelled. 4. The Maharashtra government has declared precautionary holiday for schools and colleges in Mumbai Metropolitan Region, Sindhudurga, Thane, Raigad and Palghar districts. 5. There has been rain in Mumbai and several other parts of the state, with reports of hailstorm in some parts of the Mumbai-Pune Expressway. The Western Railways has deployed extra personnel for crowd management in case of any emergency. 6. Maharashtra will witness moderate rainfall at a few places over north Konkan including Mumbai, the India Meteorological Department (IMD) said. The forecast included moderate-to-heavy rainfall at a few places "along with wind speed reaching 50-60 kmph gusting to 70 kmph" along the coastal areas. 7. The disaster management unit of Mumbai has also advised people against visiting beaches in view of high tide alert issued till tomorrow morning. Fishermen have been asked not to venture out into the sea. Coast Guard has deployed all its resources to meet any emergency requirement. 8. 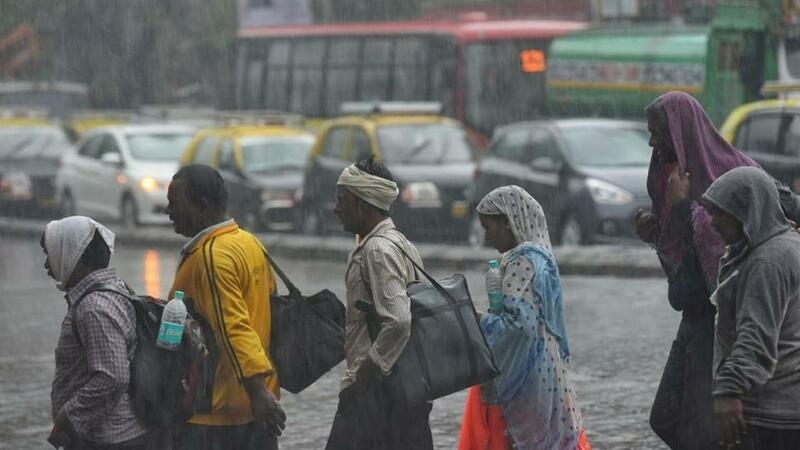 According to the IMD, Gujarat is likely to experience a wet spell during the next four days. "Heavy rainfall might occur in Valsad, Surat, Navsari, Bharuch, Dang, Tapi, Amreli, Gir-Sonath and Bhavnagar districts on December 5," it said. Gujarat Chief Minister Vijay Rupani held an urgent meeting with senior officials to take stock of the preparedness. 9. Cyclone Ockhi which held the "very severe" cyclone status has weakened into a "severe" cyclone, the met office has said. As many as 1,540 people, including fishermen, affected by the cyclone were rescued by various agencies, the centre said on Monday. Naval ships, helicopters, Coast Guard vessels and Air Force planes are engaged in the rescue and relief operations. 10. While Cyclone Ockhi was said to be weakening, another tropical storm was brewing in the Bay of Bengal on the east coast, officials said. A well-marked low pressure area over southeast Bay of Bengal is likely to become a depression and move towards Tamil Nadu and Andhra Pradesh by December 6, the regional weather office said.